Juan Pablo Montoya, driver of the No. 2 Verizon Team Penske Chevrolet IndyCar V6 celebrates his victory Sunday, March 13, 2016, after winning the Verizon IndyCar Series Firestone Grand Prix of St. Petersburg in St. Petersburg, Fla. It is the second year in a row Montoya has won this race (Photo by Michael L. Levitt/LAT for Chevy Racing). ST. PETERSBURG, Fla. – The 50th anniversary celebration season for Team Penske is off to a rousing start. 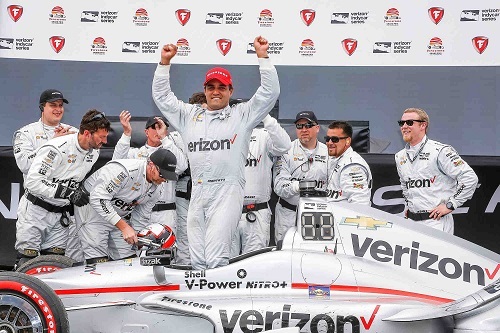 Verizon Team Penske driver Juan Pablo Montoya controlled the llast half of the Firestone Grand Prix of St. Petersburg to win the Verizon IndyCar Series season opener for a second straight year. Driving the No. 2 Chevrolet, Montoya led teammate Simon Pagenaud across the finish line by 2.3306 seconds, with Andretti Autosport’s Ryan Hunter-Reay third and Team Penske’s Helio Castroneves fourth on the 1.8-mile temporary street course. Montoya’s 15th career Indy car win ties him with Alex Zanardi for 31st on the career chart. It is also the 179th victory for Team Penske in Indy car racing, the most of any team in history, and eighth for Roger Penske’s outfit in the 13-race St. Petersburg history. “Following his on-track incident on Friday, Will Power displayed no signs of injury and was evaluated and cleared by the INDYCAR medical team. Per INDYCAR protocol, we also evaluated the data collected from his ear accelerometers, which provides data specific to the impact on a driver’s head, and nothing gathered from that data indicated further evaluation was required. Power was replaced in the No. 12 Verizon Team Penske Chevrolet by Oriol Servia, who started last in the 22-car field by rule, was involved in a mid-race multi-car pileup and finished 17th. Pagenaud, in the No. 22 Hewlett Packard Enterprise Chevrolet, assumed the first starting position with Power’s withdrawal and led the first 48 laps of the 110-lap race. The second-place finish was his best in four St. Pete races. For Hunter-Reay, it was his fourth podium at St. Pete, and a hard-earned one at that. Verizon IndyCar Series rookie Conor Daly led a career-best 15 laps midway through the event while on a different pit strategy. Driving the No. 18 Jonathan Byrd’s Hospitality Honda for Dale Coyne Racing, Daly finished 13th. The race saw just two full-course yellow conditions, tying a St. Pete record for the fewest in a race. One yellow was due to a multi-car logjam triggered when the cars of Dixon and Castroneves touched but kept going. Behind them, the No. 26 Andretti Autosport Honda of Carlos Munoz ran into the rear of the No. 15 Rahal Letterman Lanigan Racing Steak ‘n Shake Honda of Graham Rahal on Lap 57. Next up for the Verizon IndyCar Series is the long-awaited return to Phoenix International Raceway for the Phoenix Grand Prix on April 2. NBCSN will telecast practice and qualifying from the 1.022-mile oval April 1, with the race airing at 8:30 p.m. ET April 2.